Backstory Beads: This is Macaroni and Cheese? Oprah recently made headlines, admitting that she went into a major tailspin and devoured 30 pounds of macaroni and cheese when her movie, Beloved, tanked at the box office. When I found myself with an extra pound of a very good quality Asiago, I went looking for a mac and cheese recipe to use it in, and found this retooled and spiced-up version in Marlena Spieler’s Macaroni & Cheese cookbook – yep, an entire cookbook dedicated to America’s supreme comfort food. I don’t know what Oprah’s chef dished up, but this healthy and hearty version could send anyone into an eating frenzy! Cook the ditalini in a pot of rapidly boiling salted water until al dente; drain and set aside. Lightly saute the onion and garlic in the olive oil until softened, about 5 to 8 minutes. Add the broth and white wine, and if using, the bone or prosciutto. Cook for about 10 minutes, then add the cabbage, carrot, and tomatoes and continue to cook for about 30 minutes, or until the vegetables are very tender, especially the cabbage. Add the zucchini, spinach, green beans, and peas and cook for 10 to15 minutes; then add the cannellini and thyme. Season with salt and pepper, if needed. Into each bowl place a slab of cheese, then a big spoonful of the pasta and a dab of pesto. 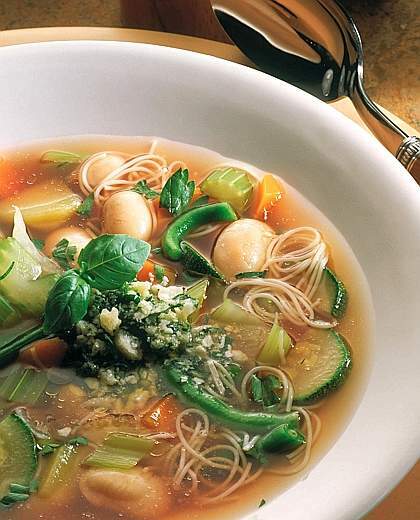 Ladle the hot soup over it all, and sprinkle the top with Parmesan or pecorino. Serve at once!